Sevilliya ruled, Sevelliya of a lineolat, Sevelliya mesh (Sewellia lineolata, Balitora lineolata) - the most popular and raspostranenny type of the sort Sewellia. The maximum size - 8 cm. Area: river basin of Mekongn of the territory of Vietnam and Cambodia. Prefers sites of the rivers with a quiet current. Soil - stony, consisting of huge boulders. Spawn in coastal thickets of vegetation. Habitat of these fishes are the covered valunamiya smooth river pebble fast water streams. The house aquarium has to duplicate these conditions as at these fishes very high oxygen requirements. In an aquarium stones, snags, to a lesser extent - plants are necessary. Suitable plants for environment of a river stream - Anubias and Microsorium. They are easily and reliably fixed on a stone hi are not afraid of a current. Sevilliya ruled loves strong circulation and aeration of water. Regular substitutions of water are necessary. Water soft, and slightly sour. Are very sensitive to contents input of nitrites. Optimum parameters of water: T =20-25ºС, dGH 2-12º, rn 6,5-7,5. Lighting has to be bright to stimulate vodoroslevy growth in an aquarium. 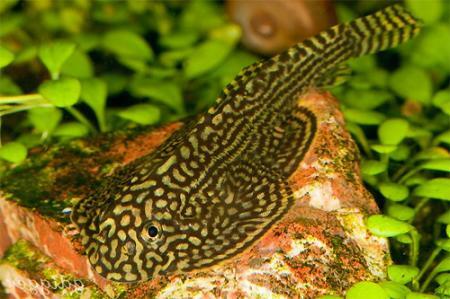 Forage: these fishes - vodorosleeda - on animal food quickly grow fat and perish. Plentiful vodoroslevy obrastaniye on all smooth surfaces of an aquarium have to make a basis of food. As top dressing qualitative dry feeds with the high content of a spirulina will approach.